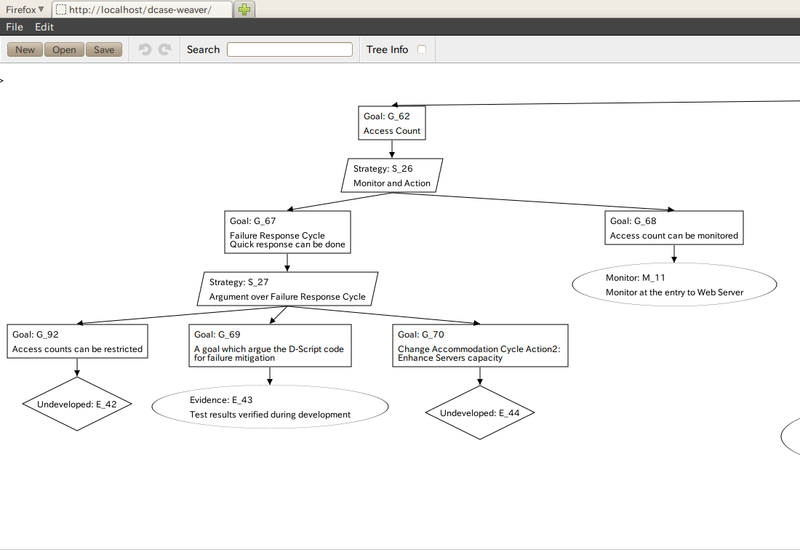 The GSN graph of D-Case is created, and Node and Link can be added, changed and deleted. The sub-tree of D-Case can be modularized. A module can be added to D-Case. The information about D-Script can be added, changed and deleted to Node. The XML of D-Case which D-Case Weaver generates is upward compatible for the XML that D-Case Editor generates. The statistical information for every type of Node of a GSN graph can be displayed. D-Case Weaver cooperates with Content Management System ( Alfresco Community Edition ) and can manage D-Case files and evidence documents. URL to related data can be attached to Node. Note: Internet Explorer cannot be used. Note: Voice narration can be heard. D-Case Weaver can be tried from here. Preservation of edit data cannot be performed with the trial version. Refer to the D-Case Weaver Specification for the installation method and the operation method.